The group is now relaxing for two nights in the same place, at a rather basic "trailer park" in the northern suburbs of Oaxaca (N 17.078408 W 96.710893). Yesterday we had a leisurely day (only 130km rather than our more normal 250km) stopping at an archaeological site and several large churches. 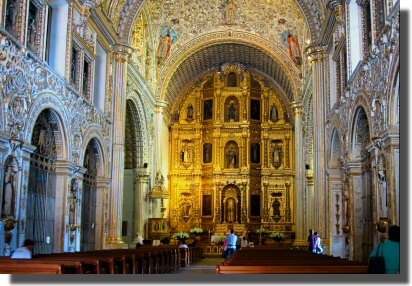 In Oaxaca (a World Heritage Site) is the Mexican Baroque Santo Domingo church. Stunning to some, gaudy to others. How much gold leaf do you need? Oaxaca's Zocalo (town square) buzzes with electric energy. Vendors, buskers, bandstand performers, basket weavers, sidewalk cafes, and dozens of children tossing interesting two metre long sausage-shaped balloons in the air in front of the magnificent cathedral. Chapulines and Gusanitos . 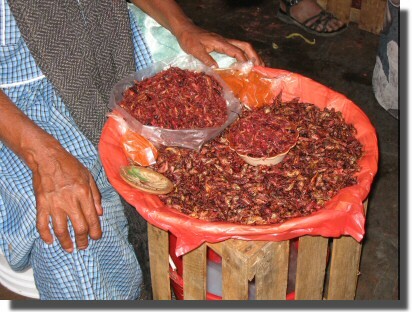 The former are bright red grasshopper-like creatures, fried in huge vats and served with lime juice. The latter are small red worms prepared in much the same manner. 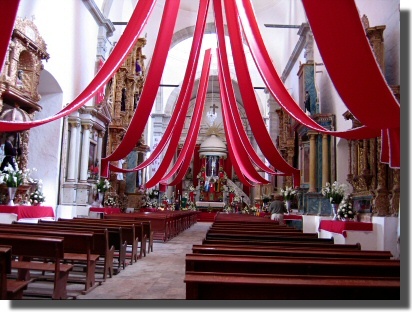 Oaxaca is known for this special delicacy. Bruce was brave enough to devour a hopper, claiming it tasted like grass. Yummy!